We’d love your help. Let us know what’s wrong with this preview of The Secret Diary of Lydia Bennet by Natasha Farrant. Lydia is the youngest of the five Bennet girls. She's stubborn, never listens, and can't seem to keep her mouth shut--not that she would want to anyway. She's bored with her country life and wishes her older sisters would pay her attention . . . for once! Luckily, the handsome Wickham arrives at Longbourn to sweep her off her feet. Lydia's not going to let him know THAT, of course, especially since he only seems to be interested in friendship. But when they both decide to summer in the fasionable seaside town of Brighton, their paths become entangled again. At the seaside, Lydia also finds exciting new ways of life and a pair of friends who offer her a future she never dreamed of. Lydia finally understands what she really wants. But can she get it? To ask other readers questions about The Secret Diary of Lydia Bennet, please sign up. Oh Lydia, why must you be so clueless? Lydia is one of those characters who you cannot fully love but neither can you fully hate. She is so very flawed but so very young and human also, and because of that, we can’t exactly blame her for everything. In ‘‘The Secret Diary of Lydia Bennet,’’ we get a behind the scenes of what happens to Lydia when she leaves for Brighton. Since it’s written in journal entries, we get every one of Lydia’s thoughts and adventurers—more like misadventures. I definitel Oh Lydia, why must you be so clueless? I definitely took pleasure in the writing style and narration. Lydia is a vivid character, therefore it is impossible for her to bore us. BUT, since she isn’t the most attentive of people and quite single-minded, she can get extremely annoying. The problem is… the only things she thinks about are boys and marriage and becoming rich. Those are shallow thoughts, in my opinion, and it didn’t make the romance more romantic. In the contrary, since money is so important to her and the idea of ‘‘marrying up’’ keeps flooding her mind, it took away from the romanticism. I’m a diehard fan of novels written in journal entries, which is why I was entertained and interested from the very beginning. The letters also contributed to that. BUT, I wouldn’t be so sure someone who is not a fan of those will enjoy this very much. I absolutely love Pride & Prejudice retellings (or spinoffs or whatever you want to call them), but this one didn't really work for me. The tone and characters just didn't fit and felt more like bad fanfiction than anything associated with Jane Austen. Plus, there's not much plot and the whole thing was pretty dull. 5 Words: Love, family, adventure, disappointment, learning. I don't like Pride and Prejudice. I did like this story immensely. I loved how Lydia's passion and impulsiveness came across - in the pages of this story she was very different from the character we see a little of in P&P, but still so faithful to Austen's creation. Lydia becomes a three dimensional character with thoughts and feelings and I loved the twist to her story. The writing perfectly represents her without becoming annoying. A unique take on Lydia's version of Pride and Prejudice and the motives behind her actions. This is written in diary form from Lydia Bennet’s perspective, the youngest Bennet sister in Pride and Prejudice and the author takes it for granted that the reader will have a good working knowledge of the plot of Pride and Prejudice. The diary format allows the reader to see Lydia’s surprisingly sympathetic feelings about the things that are happening to both her family and herself and still manages to tie them into her sometimes morally dubious actions. There was no attempt to put a Jane Austen spin on the writing style of this diary which has both its positive and negative aspects. It’s positive because had the author attempted Jan Austen’s style she would have inevitably failed as authors before her have done. However the fact that there was no attempt at all of Lydia writing things as a women in the 1800s would have done was occasionally jarring, such as describing Jane’s age as twenty-three instead of three and twenty. That kind of thing is just too modern a style of writing. Lydia was portrayed in a very sympathetic way. She displays more sisterly feelings than is evident in Pride and Prejudice and she has an awareness that some of her actions aren’t really the correct thing to do (even though she normally does it anyway). Well the author was constricted by Lydia’s actual actions in P&P so I supposed her hands were tied. Lydia definitely gave the impression of being a girl born in the wrong era. It would be easy to imagine her as a young women in the 1960s where her “radical” thoughts on women rights would have made her fit right in and maybe would have made her feel less isolated. This is only the second P&P variation I have read from Lydia’s perspective and the first that shows her doing the things she does for logical and less selfish reasons. And even though those actions are often immature and misguided it is a lot easier to like her. The thing that surprised me most was Lydia and Wickham’s relationship. Despite what you know about both characters in P&P, it could almost be described as a love story – almost. Despite it being aimed at a young adult audience, the plot is so unique I would recommend it for any Pride and Prejudice fan. When I re-read Pride and Prejudice I think this is going to be canon for me in regards to Lydia’s role in the novel. Es hat soo viel Spaß gemacht :D Es war spannend und interessant, romantisch und abenteuerlich. Nur das Ende hat mich ein klitzekleines Bisschen gestört. Es ging mir dann einfach zu schnell. Well, if you've read any of my reviews about other P&P retellings, then in order to catch my interest they must be high quality, believable and unique, but still keep that infinite feel of P&P. This hooked me from the very beginning! This was not the Lydia I thought I knew, but rather a twist on a character that oddly enough worked well for the book. Coming from someone who drinks her tea from a "I'd rather be at Pemberley" mug, you know how dear I hold the original book. This is a worth Well, if you've read any of my reviews about other P&P retellings, then in order to catch my interest they must be high quality, believable and unique, but still keep that infinite feel of P&P. This hooked me from the very beginning! This was not the Lydia I thought I knew, but rather a twist on a character that oddly enough worked well for the book. Coming from someone who drinks her tea from a "I'd rather be at Pemberley" mug, you know how dear I hold the original book. This is a worthy homage. I know, I know. I should know better. I have been through so many of these retellings at this point I should be able to know instantly that 9/10 times I’m not going to like them The Secret Diary of Lydia Bennett was no exception. Full disclosure, I bought this book thinking it was somehow related to the web series that everyone has bemoaning about for the past few years with a slight recover design. It’s not though. To see full review click here. Full disclosure, I bought this book thinking it was somehow related to the web series that everyone has bemoaning about for the past few years with a slight recover design. It’s not though. I don’t know why I thought it was. Lydia is wearing full on regency regalia on the cover and that series is a modern retelling. Nope. Nope. Nope. From what it read like it was like if in Princess Diaries if Mia would’ve stayed with Creepy Josh. Just ew. And that’s how young Lydia seemed like first book Mia. That’s way too young for Wickham who has to be like at least in his mid twenties but whatever. Look, if you want to read Pride and Prejudice I suggest you read the real things. If you want to read a retelling, you need to find one with a better twist than this. Switching view points, is a notorious fan fic trope. While it is true that there have been retellings done in alternative view points that have been awesome, this is not one of them. It didn’t add anything to Jane Austen’s story and the fact that Lydia read so young just made the Lydia/Wickham ship even ickier. Lydia is one of the most annoying and hated characters in Pride and Prejudice. When she marries George Wickham, we are happy that she is sent to live a life of unhappiness. Yet, in The Secret Diary of Lydia Bennet, we are given a look from Lydia’s perspective during her romance with George Wickham. Thus, we the reader not only get to hear her side of the story, but we get a glimpse of Lydia’s character. Lydia is still childish and silly. However, she is still a teenager. She makes mistakes. She Lydia is one of the most annoying and hated characters in Pride and Prejudice. When she marries George Wickham, we are happy that she is sent to live a life of unhappiness. Yet, in The Secret Diary of Lydia Bennet, we are given a look from Lydia’s perspective during her romance with George Wickham. Thus, we the reader not only get to hear her side of the story, but we get a glimpse of Lydia’s character. Lydia is still childish and silly. However, she is still a teenager. She makes mistakes. She is very naive and idealistic. She is bored with her life in the country and wants to go to the city and experience the world. She dreams of marrying a handsome rich man. Yet, she falls for Mr. Wickham because he seems to understand her. Thus, Lydia is often misunderstood. She is a woman who does not want to live strictly within a society. She wants society to conform to her ideals. Because of this, Lydia is represented as a victim. However, because Lydia is very romantic and stubborn, she is determined to get her way. Overall, this book is about choices, responsibility, and love. I found the characters to be believable. I also thought that this book fits well with not only, Pride and Prejudice, but also as a Jane Austen novel. I did find the writing to be a little too modern, but I thought that it suited Lydia’s voice. After reading this book, I found that I like Lydia a bit better than I originally did. 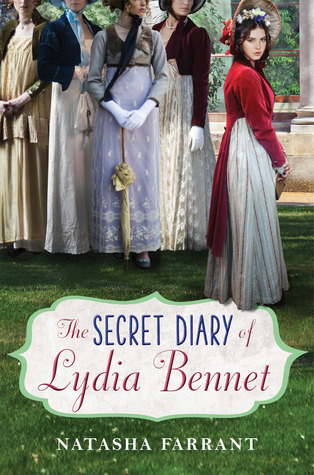 The Secret Diary of Lydia Bennet is a light and fast-paced read. This novel is also perfect while eating dessert or sipping coffee. I recommend this story not only to fans of Pride and Prejudice and Jane Austen, but those who want to see Lydia Bennet in a different light. This was really cute! I've read Pride and Prejudice parts of it, and despite finding Lydia kinda impulsive and annoying, I always felt sorry for her ultimate fate of running off with a man who didn't love her, then being made to marry him to protect her reputation. However, I still found her interesting in spite of all that, and wanted to know what was going through her head when she said and did everything she....well said and did. I will now consider this book canon as to what really happened to Lydia throughout the course of the actual classic. I genuinely found her amusing and hilarious in this book-her snarky one-liners reminded me of myself! And I felt her longing for adventure, to leave her simple country home. Of course, most of this book takes place at Brighton, which is on the sea, and Lydia's various adventures there. To my disappointment, the relationship she had with the soldier from the actual book, Wickham; she mainly just gets annoyed by his actions and wants to be more than just friends. Most of her romantic feelings are given to a French count, who ultimately abandons her instead of Wickham. I did like seeing Lydia trying to improve her intelligence for the count, and becoming a braver person in spite of that. I wasn't too bothered by her modern dialogue, I understand why the author chose to write it in such a way. Austen's actual writing style would've alienated a lot of younger readers. This book also takes place in my favorite time period for fashion, the Regency era! Seeing the cover and all the descriptions of the gorgeous Regency gowns made my fashionable heart soar. I do wish more books took place during this period, and not just the 'bodice-ripper' romances where the dresses aren't very historically accurate. A fresh, funny, and spirited reimagining of Jane Austen's beloved Pride and Prejudice, The Secret Diary of Lydia Bennet brings the voice of the wildest Bennet sister alive and center stage like never before. Huge thanks to Natasha Farrant, The Chicken House Publishers, Edelweiss, and Rockstar Book Tours for sending me a free copy of this title in exchange for an honest review! This in no way altered my read of or opinion on this book. "I wish I were a man," I said. "Instead of a girl, obliged to sit around waiting for no-good suitors to decide if I am fancy enough, or to throw myself at idiot clergymen. If I were a man, I could do something." If you've been following my reviews for ANY amount of time, you'll probably already know that I am head-over-heels in love with Pride and Prejudice. I own an entire bookshelf of retellings, adaptations, and companion novels. I have watched The Lizzie Bennet Diaries upwards of seven times since discovering it last year. If I could live inside the world of a book for a day, I'd pick Jane Austen's beloved classic...and I'd enjoy every moment of it. It should be no surprise, therefore, that when I saw this book in a book tour email... I immediately jumped at the chance to read and review it. I HAD to. There was no other choice. I did NOT, however, expect to have my feelings about one character in particular swayed so very much by a single book. So this is what I'm going to start with: Wickham, you're a scoundrel....but somehow, you made me love you?! How?! How did you even MANAGE that, when before I was so set against you and everything you stood for? Seriously, penguins--if you're of the same mind I was before this read, and loathe Wickham entirely... Maybe you shouldn't read this book. Because by the end of things, you will be so, SO conflicted and confused. Wickham especially is one of those characters that surprises you, and this book was written in just such a way as to make readers view him as complex, flawed...and entirely human. I bow down to Natasha Farrant, actually--it is difficult, once my mind is so set against a character, to make me change it, and she managed that in just over 300 pages. "Do purple and yellow make a person look older?" I asked. Wickham said no, they made a person look like a particularly dangerous mushroom, and made me snort with laughter. This is SUCH a lovely and well-written nod to Jane Austen's classic, guys. Lydia's story is allowed to breathe and shine through, LYDIA! is allowed to breathe and shine through these pages...but the original story is still there, woven throughout, shifted and molded to match the appropriate perspective. In fact, through Lydia's eyes, we are able to see a much different story occur--and able to make a more fully formed opinion of the situation as a whole. Natasha Farrant tipped her head to Jane Austen, while still maintaining enough distance to make this wholly and individually her own. And her voice! Oh my penguins, guys, Lydia's a uniquely individual and AWESOME character, and I am so so glad we are finally able to see her in all her glory. She is adventurous at heart, but always tied down by societal opinions and judgments on what proper "females" should or should not do. She, like most women I know today, longs to strike out on her own, do something for herself--find her place with like-minded and understanding individuals. I just... there is SO much growth and emotion behind Lydia's story. I adored every moment spent within her head, hearing about the world from her own words--it was an entertaining, often laugh-out-loud experience. Love, in our household at least, seems to cause an awful lot of misery. Oh well, I did not love this book, but I did not hate it either, however annoyed I was with Lydia. But just "meh"... I kinda knew even before starting that I would find it shallow, and it was a great deal shallow - therefore a great book for metro rides and lazy Saturday afternoons. It was nice to see how the author tried to make Lydia a sort of feminist and strong character, but it nevertheless failed because Lydia is just so shallow and, well, not the brightest, however strong she was sometimes Oh well, I did not love this book, but I did not hate it either, however annoyed I was with Lydia. It was nice to see how the author tried to make Lydia a sort of feminist and strong character, but it nevertheless failed because Lydia is just so shallow and, well, not the brightest, however strong she was sometimes depicted. It's kind of frustrating, even more so when you know how everything will end (if you've read Pride and Prejudice of course, but who hasn't?). Lydia Bennet is the famously 'wild' sister in Jane Austen's Pride and Prejudice. I suspected this book would attempt to 'explain' her behaviour and while in parts it does in other ways it is simply another story which centres on her. I should say this is not, as I initially thought, solely a book that tells Pride and Prejudice from a different angle, there is new aspects of story to make it new and not repetitive. While I did enjoy it, I wouldn't say it's something I'd consider a 'must read'. I think that Lydia is a fantastic book, showing the much loved personality and exasperating thoughts of a young teenaged girl set rouge in Brighton in the late 18th century/ early 19th century. It explores further into the youngest Bennet daughter from Pride and Prejudice and gives her the leading role as she has been longing for. Separated from her somewhat reserved sisters seems to unleash a whole new light for the youngest Bennet daughter and she is encouraged by her 'snobby' sister Mary to t I think that Lydia is a fantastic book, showing the much loved personality and exasperating thoughts of a young teenaged girl set rouge in Brighton in the late 18th century/ early 19th century. It explores further into the youngest Bennet daughter from Pride and Prejudice and gives her the leading role as she has been longing for. Separated from her somewhat reserved sisters seems to unleash a whole new light for the youngest Bennet daughter and she is encouraged by her 'snobby' sister Mary to take note of it in a diary (to her utter disgust). In search of an adventure, she finds herself mixing with the highest classes of England at balls, meeting exotic travellers from places such as India and a young flaming redhead with an unheard of profession for dressmaking. But when some people don't turn out to be who they say they are, there's no way that Lydia is going to let them off that easily. In the words of Lydia, it is monstrous fun and I would recommend it to anyone, especially lovers of the well-known classic, Pride and Prejudice, although it is not essential to have read it. I really enjoyed this!! A bit (a lot) of artistic licence, but it was nice to hear the nice side of Lydia. Recommend! i really enjoyed this, easy writing and making lydia come alive and being seen from a new angle. Dans le roman originel de Jane Austen "Orgueil et préjugés", ainsi que dans les différentes adaptations télévisuelles ou cinématographiques, Lydia, la jeune soeur Bennet, passe toujours pour -si ce n’est la plus stupide- au moins pour la plus frivole et la plus inconséquente. C’est par elle que le malheur arrive, c’est elle qui fait courir une grave disgrâce à toute sa famille, et il nous semble que peu lui importent les conséquences. Dans ce roman, Lydia tient, sur une année, un journal intime, Dans le roman originel de Jane Austen "Orgueil et préjugés", ainsi que dans les différentes adaptations télévisuelles ou cinématographiques, Lydia, la jeune soeur Bennet, passe toujours pour -si ce n’est la plus stupide- au moins pour la plus frivole et la plus inconséquente. C’est par elle que le malheur arrive, c’est elle qui fait courir une grave disgrâce à toute sa famille, et il nous semble que peu lui importent les conséquences. Dans ce roman, Lydia tient, sur une année, un journal intime, que lui a offert sa soeur Mary pour son anniversaire. Elle vient d’avoir quinze ans, la vie lui tend les bras, même si ses perspectives d’avenir restent limitées. Jeune fille de bonne famille de la gentry campagnarde, elle ne manque de rien, même si ses parents n’ont pas trop d’argent. Frappée d’entail, une disposition testamentaire qui favorise un héritier mâle, même si c’est un parent éloigné, la propriété paternelle ne reviendra à aucune des filles Bennet. L’enjeu pour elles est donc de faire un avantageux mariage. C’est une tout autre Lydia que nous présente la plume de Natasha Farrant (dont on avait tellement aimé le roman "Les Amants de Samaroux"). Tout en restant proche du texte et à l’histoire de Jane Austen, elle nous offre le point de vue d’une jeune fille bien moins sotte qu’on pourrait le croire, une jeune fille qui aime rire et vivre, qui se moque des convenances et qui aspire à plus de liberté. Son personnage est résolument moderne, elle se révolte sans cesse contre la condition féminine qui est celle de son époque, celle qui ne lui permet de strictement rien faire, si ce n’est de trouver un bon parti pour se marier, et le plus tôt est le mieux. Natasha Farrant en fait une héroïne très attachante, une jeune personne proche de ses soeurs, très admirative d’Elizabeth, qu’elle considère comme un modèle bien supérieur à elle. C’est un aspect de ce personnage qu’on n’aurait pu soupçonner, et c’est bien vu et bien pensé, car c’est toujours cohérent. "He entered. His beauty in scarlet regimentals was overwhelming. The world went black and I thought perhaps I had died, but then Kitty nudged me and I realized that I was alive, but had merely closed my eyes." Lydia is my absolute favorite Bennet sister, she's frivolous, self-absorbed and completely unaware most of the time that she in inappropriate. I really enjoyed that someone decided to delve into Lydia and her character. In this book Farrant makes Lydia far more complex than in the original "He entered. His beauty in scarlet regimentals was overwhelming. The world went black and I thought perhaps I had died, but then Kitty nudged me and I realized that I was alive, but had merely closed my eyes." In this book Farrant makes Lydia far more complex than in the original Pride & Prejudice. She's far smarter than she believes, anytime she starts to be clever she recalls how all of her own family believe she is stupid and belittle her. She does prefer things like fashion and dancing but she spends a good chunk of her time studying while in Brighton. To be fair, she was studying to impress a man she had met. I really liked Lydia's relationship with Wickham, they're almost frenemies. She quickly learns that he is trying to use women to increase his wealth and status by marrying them and is not pleased with that idea at all. She distances herself from him but ends up helping him try to woo the cousin of the man she's falling for in Brighton, but only because he's blackmailing her. I liked how Lydia didn't run away with the intention of marrying Wickham, that she'd long decided she didn't want him as a husband. The way Farrant made it work out was really cool, I liked how she made it this whole other story and really made it her own. I liked that it's a story we would never know otherwise rather than just told from a different perspective. I thought is book was fun to read and I think any fan of Pride & Prejudice would enjoy reading this book. Even if you're not a big fan of Lydia (but seriously how can you not love her?). I'm a sucker for Pride and Prejudice, so sometimes when I see other authors' attempts at adding to the original story, I pick them up and try them. Most of the time I'm really disappointed because they turn out to be unrealistic or weird or because they try too hard to sound like Jane Austen and fail. But I'm glad I took a chance on this one, because I ended up really liking it! I gobbled it up. Though I was kind of skeptical of some of the new characters and the plot twists Farrant introduced, I'm a sucker for Pride and Prejudice, so sometimes when I see other authors' attempts at adding to the original story, I pick them up and try them. Most of the time I'm really disappointed because they turn out to be unrealistic or weird or because they try too hard to sound like Jane Austen and fail. But I'm glad I took a chance on this one, because I ended up really liking it! I gobbled it up. Though I was kind of skeptical of some of the new characters and the plot twists Farrant introduced, like (view spoiler)[making the whole running-away-with-Wickham thing not about Wickham at all but a ruse, (hide spoiler)] I thought they actually made sense in the end. Farrant's version of events could have happened—it wasn't out of the realm of possibility—so I can't dismiss the book by saying, "That was ridiculous!" Plus, she imagines plausible motivations for some characters that help explain why things turned out the way they did. Also, I like Farrant's writing style and the way she portrayed Lydia's voice. Of all the Bennet sisters, Lydia probably lends herself the best to a modern YA novel because of how she acts and thinks. But even so, the language of the book didn't feel or sound modern, but nor did it sound so stilted and old fashioned that it became unnatural because a 21st-century author couldn't replicate the speech of the period. You can tell that Farrant researched Bath and its fashions and customs well, too. It was particularly interesting to read about how people went sea bathing back then. When I first heard of this book, I wasn’t so sure. The cover definitely isn’t the best thing, and it sounds like a copycat of The Secret Diary of Lydia Bennet from the Youtube Lizzie Bennet Diaries series. But it’s really not. And I’m glad that I read it. It was a pleasant surprise that I really enjoyed. BTW: I’ve seen a better alternate cover and a different title: The Wild Girl of Pride and Prejudice. So I’m not sure which one came first. Anyway, basically, this is the diary of Lydia Bennet in the actual Pride & Prejudice setting. We get journal entries from her, and it was really interesting to see a different side of the story. Especially since Lydia usually gets kind of a bad reputation. This story definitely gives her a voice and some redemption. In the original P&P, we don’t really know what happens with Lydia when she goes to Brighton. All we know is that she ends up with Mr. Wickham, and we always just kind of assume the worst. This novel twists our assumptions around and leads us in a direction I definitely didn’t expect, but it was one that I enjoyed. Being a big fan of Pride and Prejudice I was so excited to get to read this book about the boldest member of the Bennett family . Lydia's story takes place at the same time as the original Pride and Prejudice so it's easy to jump into the story if you are already familiar with the plot. Mary gives Lydia a journal for her to keep in the hope it will improve her sister , so begins a look into this outgoing Bennett sisters life in diary form. Seeing the story from Lydia's perspective is an eye open Being a big fan of Pride and Prejudice I was so excited to get to read this book about the boldest member of the Bennett family . Lydia's story takes place at the same time as the original Pride and Prejudice so it's easy to jump into the story if you are already familiar with the plot. Mary gives Lydia a journal for her to keep in the hope it will improve her sister , so begins a look into this outgoing Bennett sisters life in diary form. Seeing the story from Lydia's perspective is an eye opening experience and she is just as outspoken as you would expect her to be . Reading about her adventures while away from her family and on holiday is an eye opening experience , she has a need to show off at every available oppertunity and in her letters home to her family she does this as often as possible . This was a delightful story and it would make a great read for any fan of Pride and Prejudice. I received this book for review from the lovely people over at Lovereading4kids. Okay, so this book is sort of a reimagining of Pride and Prejudice. Oh Jesus. Now, now, this doesn't automatically make the book bad. I mean, sure Pride and Prejudice is a timeless classic relevant even 200 years after its publish date, but I'm SURE it'll be fine. Okay, so before I dig into this book similar to a starved hyena getting a scrap of food, I want to talk about the good things. Because there are good things. Just not...great thing. 1). The book isn't I-I tried? 1). The book isn't a "rip off" of Pride and Prejudice. This isn't something where it just blatantly rips it off. In fact, this is largely its own story. It isn't the story of sensible Elizabeth and too much pride and too much prejudice. This takes place in the same world, yes, but it's more the story of a side character going through her own story arc while she is somewhat unaware that she is part of a larger story. The best thing I can compare this to is the movie The Lion King 1 1/2. If you've never seen it, it's a movie exploring Timon and Pumbaa's backstories, how they met, and how they affected the plot of the overall original Lion King movie. Technically it's the character arcs of Timon and Pumbaa, but as we see from multiple "humorous" interactions, Timon and Pumbaa unknowingly affects Simba's, the obvious main character who is given the shift, personal story. 2). It knows what audience it's catering to. This author knows that she isn't really appealing to roughly the sixteen-and-up crowd, it's more the ten-to-fourteen crowd, and the writing reflects that. Although I have major problems with this author's writing (which I'll address later in the interview), it doesn't try and copy Austen's writing. In fact, the author even addresses that in the back of the book, how she just wanted to do her own thing through and through. It knows what it's trying to be and it sticks to it. It knows that it's not going to be on the same level, and it never tries to act like it's any more than it is. It's pretty refreshingly humble. 1). This book has a lot of stuff dedicated to Lizzy-Elizabeth. The first 100 pages (which was all I was able to get through) is the characters being introduced and a who-will-Lizzy-marry. But here's the thing: I don't care. I don't care because I read the book. I know how it goes. There isn't any suspense, because I know it. I get what the author is trying to do, but it just doesn't work. I get that it's dramatic irony, but still. It just comes across as dumb. Anyone who read the original knows Elizabeth marries Darcy, and not any Mr. Collins or Mr. Whickham or whatever Ripoff-Darcy's name is. 2). The characters aren't that strong. Okay, so the original novel was almost a salute to feminism; that book was written in a time where women were not allowed to write or read or be strong or educated, and Austen's defiance of the system matches Elizabeth's, but also shows that this smart, strong woman isn't perfect, and maybe she's too strong. This book...kind of does something similar. Now, this book tries to do something similar with its protagonist. Lydia, THIS book's protagonist (whose name I kept forgetting) is supposed to be more of a strong, wild protagonist, but needs to learn to calm down and be more mature. Okay, I could do that. That actually sounds good. Maybe it could be something like Brave? But it just isn't done well. She just has such a flimsy character. She just has various degrees of stupid. And yeah, you could say that this is because she's only fifteen and she doesn't know better and she wasn't educated and anything else, but....it just doesn't work. The protagonist isn't interesting enough to be engaging, and none of the other characters have any other real "development." This is especially important, not only considering the original source material, but also considering the nature that this book is told in. This book is told in diary entry format, similar to The Princess Diaries or All-American Girl, two coming of age stories with female protagonists who are the same age as Lydia, our main character. However, these books work because they have interesting characters, and when you only see the world from one character's eyes, your character has to be well-rounded and interesting. It just doesn't work with this format. 3). The writing is just...bad. Okay, so basically this is the plot of a fifteen-year-old girl falling in love and dealing with all the emotions that come with a first love. Now, admittedly, there's a lot you can do with this. Like, a lot a lot. But it's just a whole lot of nothing. NOTHING. Just Lydia smiling and gagaing over Wickham and being totally oblivious to anything but herself. Ew. Not much to go on character-wise. Now, I've read a lot of books where the characters are bland, but the plot and writing is pretty good. Marie Lu actually does this a TON, but her writing is good enough to be enjoyable. However, this is because her writing isn't stagnant. Her sentences work with the plot and make you FEEL something, like you're in the action. This writing isn't exactly detached, making you feel like you're extremely separate from the characters, much like Gregory Macquire's, but you do feel...different. And isolated. The writing doesn't draw you in or change with the character's reactions. It stays the same one-note happy, and it's one of the biggest turn-offs from the book. Natasha Farrant grew up in the heart of London's French community, and currently combines writing with her career as a Literary Scout. She is the author of two successful novels for adults, Diving Into Light and Some Other Eden, both published by Transworld. She lives in West London with her husband, two daughters and a large tortoiseshell cat.